This week I will be reviewing “Yum! MmMm! Que Rico! 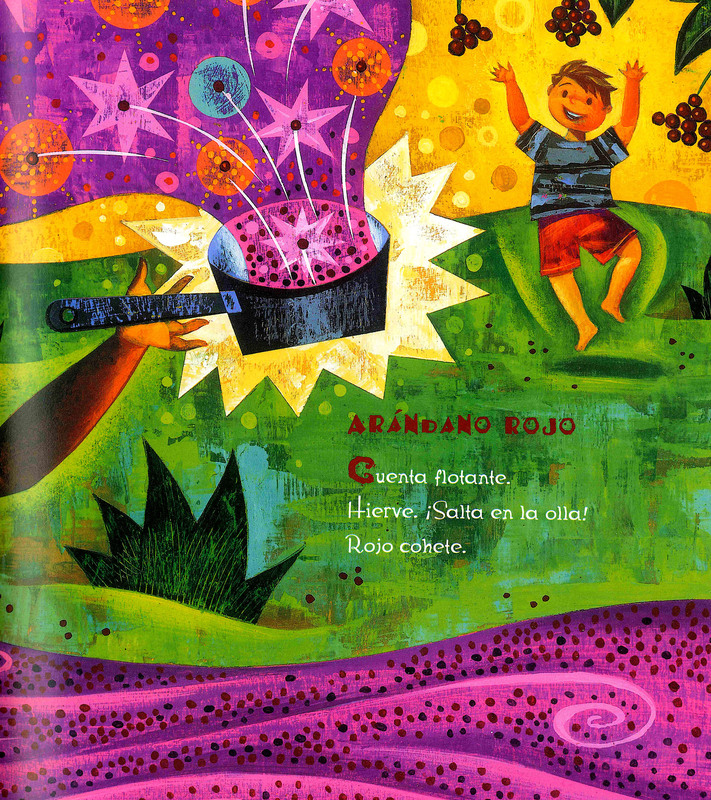 America’s Sproutings / Brotes de la Américas“, written by Pat Mora and illustrated by Rafael López. The book is available in both English and Spanish editions, although I will be reviewing the latter. 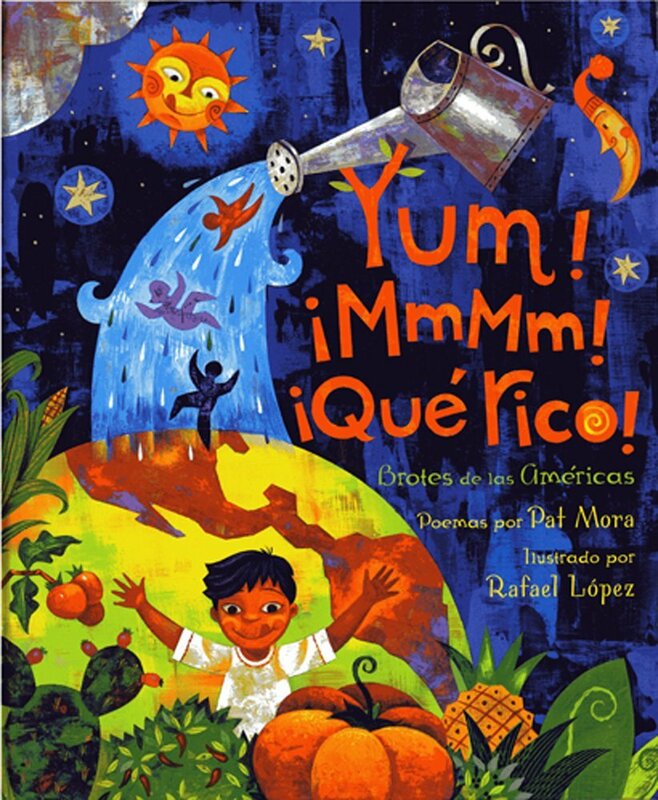 In this wonderful collection of poetry, Pat Mora takes us on a gastronomic journey of the Americas through a series of fun haikus. Each poem focuses on a crop native to these continents, culminating in a full harvest of celebration and praise. 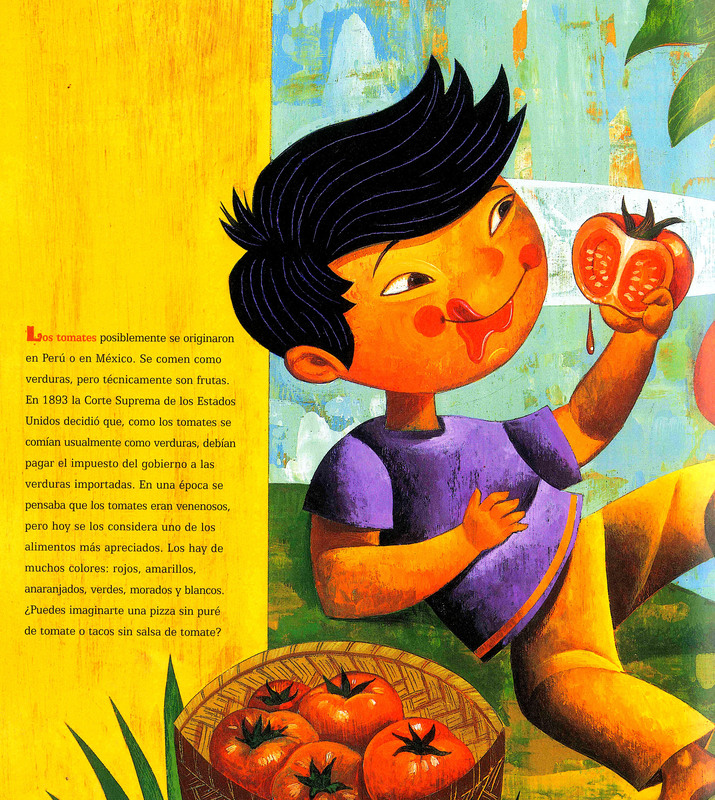 The descriptions of food and cuisine alongside the bright, multicolored illustrations at once awaken the senses while guiding readers through the history of agriculture in the Americas. Mora introduces her book by acknowledging the influence of her anthropologist husband who teaches about the origins of agriculture, an inspiration that certainly resonates throughout her collection. Readers will undoubtedly revel in this delicious feast of knowledge, art and poetry. Each page is dedicated to a specific food. The poems on each page follow the structure of Japanese haikus, a form of poetry in which each poem consists of seventeen syllables. At the bottom of each page Mora also provides a paragraph of background information about where the food can be found, where it originates , and how various cultures tend to prepare it. This book is most suitable for children ages 7-12. Although the long, informative paragraphs on each page might be more interesting for older readers, younger readers will surely appreciate the anthropomorphic images of, for instance, a dancing pineapple and a smiling piece of toast. The collection has an unfettered tone of cheer and delight that will spread to readers of all ages. 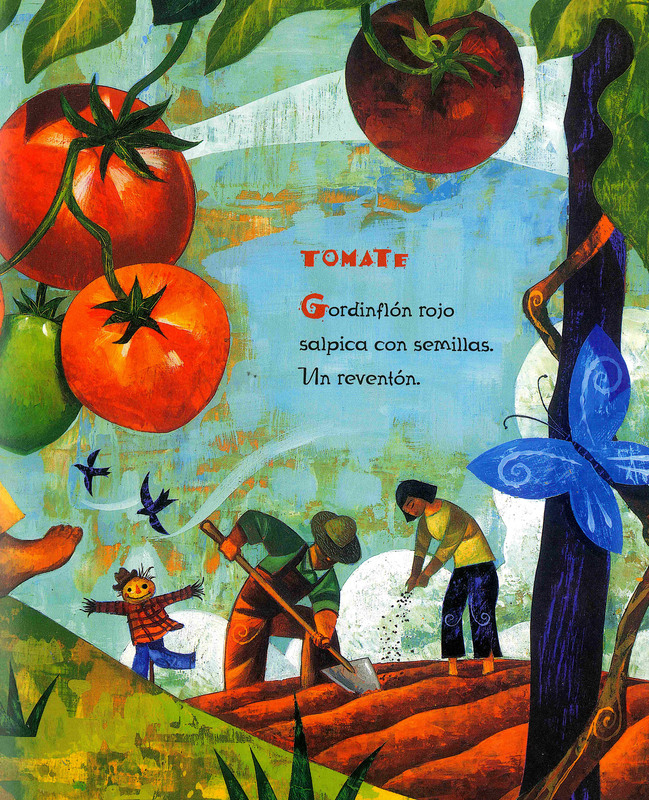 As Lee and Low Books states, “Brimming with imagination and fun, these poems capture the tasty essence of foods that have delighted, united, and enriched our lives for centuries.” Indeed, Mora’s poems as well as López’s illustrations emphasize not only the wonderful pleasure of food, but also the cultural, societal and familial importance related to sharing food with others. The beautiful illustrations are done with acrylic on wood panels and show a range of family, friends, and community members enjoying each others’ company and various foods. 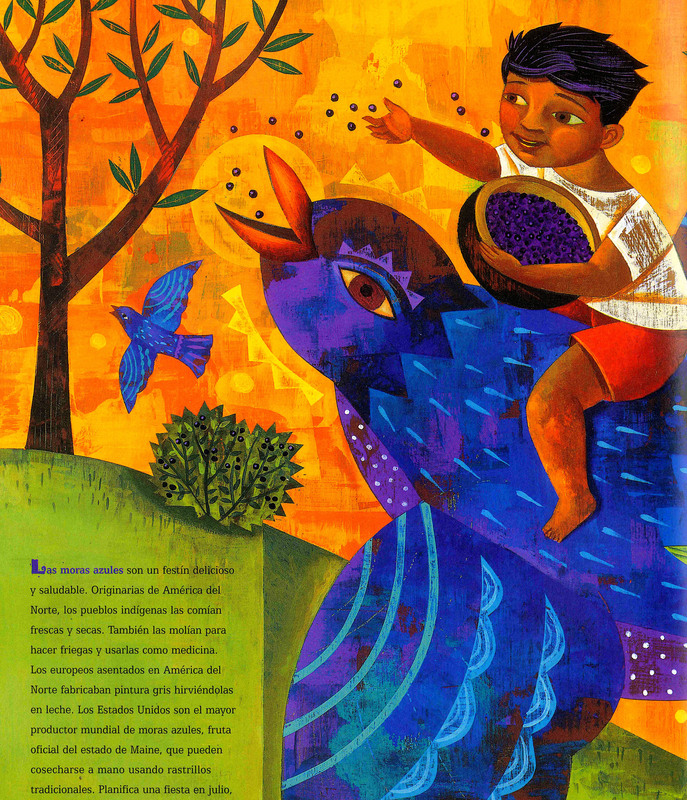 Although the featured foods come from across the Americas, North and South, many of the illustrations seem to evoke the warm climate of Central America. According to Lee and Low Books, illustrator Rafael López “grew up in Mexico City, and his art is strongly influenced by the work of Mexican muralists.” Additionally, “he has created many large murals for public spaces, including the Urban Art Trail Project in downtown San Diego.” The images are certainly reminiscent of mural art with their bright colors, mesmerizing patterns and attention-grabbing compositions that depict scenes from every-day life (albeit with a twist of the imaginary). Mora does not shy away from discussing the influence of European colonizers on the peoples of the Americas. 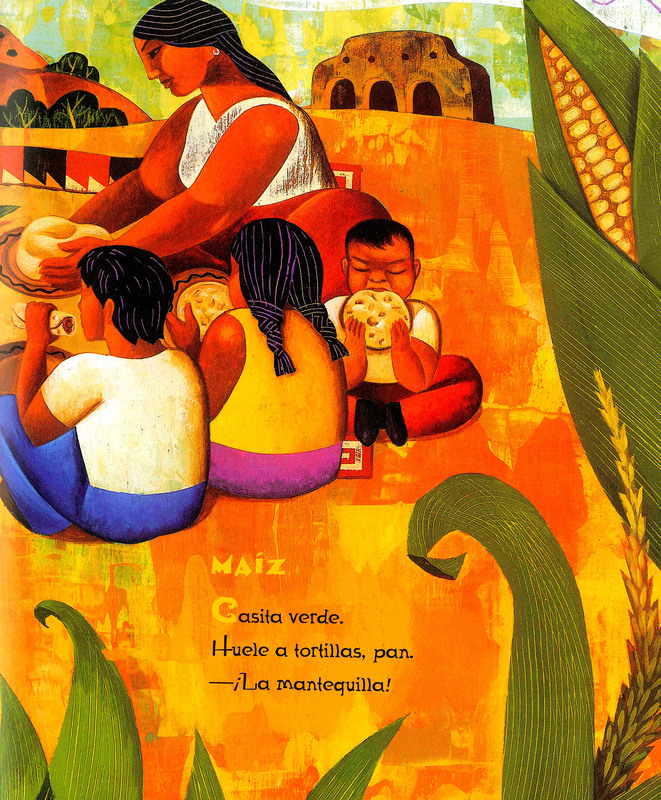 A useful resource for teaching about history, conquest, and colonization, Mora also describes how the crops were used both before and after European settlers arrived. In the back of the book she includes a note to readers where she states that people of the Americas enjoyed these foods long before Christopher Columbus or any other European arrived. This is a valuable topic to mull over with students during the Thanksgiving season. While we use this month of November as an occasion to show thanks and appreciation to our loved ones, and to enjoy our favorite foods, let us also use this month as an opportunity to critique the origins of the Thanksgiving holiday in the Americas. It is always an important time for better understanding the history, traditions and ongoing experiences of indigenous peoples. Moreover, in her note to readers, Mora explains her love for diversity amongst people and within poetry: “Me gusta la diversidad en la gente y en la poesía.” She adds that one of the reasons the haiku poems were so fun to write is that they permit the creator to jump from subject to subject, from image to image, given their short and sweet format: “El haiku invita en saltar de imagen en imagen.” To embrace her love for diversity, Mora uses the haiku poems to cover a wide range of foods, countries and cultures. As we are all always looking for ways to diversify children’s literature, I’m sure readers will appreciate Mora’s open celebration of diversity. A classroom teacher could certainly use Mora’s book as an inspiration for a classroom poetry-writing activity. Imagine a teacher bringing in foods like kiwi fruit, avocados, mushrooms, mangoes, scallions, bananas, apples, and strawberries for students to observe, eat, and then write poems about. The students could describe the foods in regard to how they look, smell, feel, and taste. Students could also be encouraged to make comparisons and to use figurative language as Mora did when describing the foods and gustatory sensations. This w ould be the perfect opportunity for children to delve into their creative sides and reflect upon the beauty in every-day objects. Students will also build upon their vocabulary (in English or in Spanish) as they think of descriptive words and adjectives. Furthermore, the practice of working from a still-life model spans all different forms of art from all different cultures, and has been used by peoples for centuries and centuries. This kind of artistic lesson could lead to other lessons on important literary or artistic figures, including Chilean poet, Pablo Neruda, who also produced a series of “odes” to ordinary objects. According to Words without Borders, “We enjoy the world anew through his eyes: yes, a simple artichoke can be seen as a soldier, wrapped in armor and ready for battle; an onion is “more beautiful than a bird / with blinding feathers.”” Additionally, Mexican artist Frida Kahlo has produced a series of still-life paintings from different assortments of fruits and vegetables. Students could create still-life paintings or drawings like Kahlo’s while also learning about the influential icon. Rarely does a children’s book open the door to such a wide variety of lessons on the literary and fine arts, that can also be adapted to fit a variety of age groups. Clearly, I am a big fan of this book. To summarize, it does an excellent job of incorporating various elements of the arts, while giving readers a taste of anthropology, history and geography. Print out for poetry and/or art lesson: print these out and give them to your students for them to “draw their favorite food” and “write a haiku” to match. Stay tuned for more wonderful books! 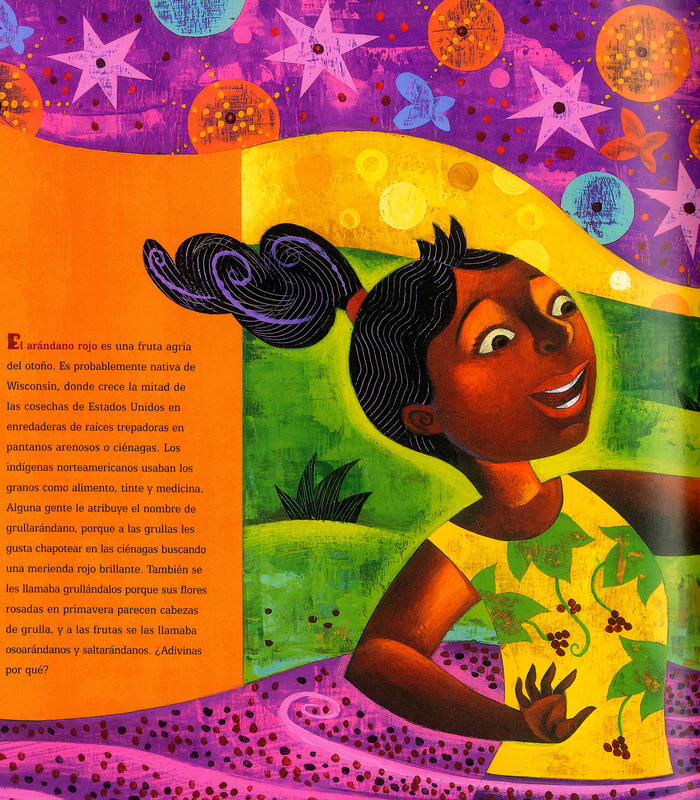 The colorful illustrations by Rafael Lopez are great, and I agree with post saying that they display the warmth of Central American. Sadly, I can read it on Kindle on Amazon website. But it’s nice to connect food with poems.